This text serves as a comprehensive review for pathologists and dermatologists in practice and in training and provides a great quick reference for looking up practical problems in the recognition and diagnosis of inflammatory and neoplastic skin lesions. Its innovative, accessible outline format, bullet point style, and numerous high quality images make essential, key facts for any given lesion easy to find and retrieve. Numerous algorithms of differential diagnoses help direct the user to the most likely diagnosis of any suspect lesion. 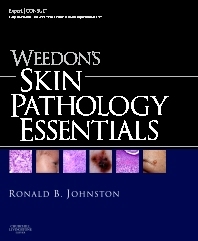 The content is cross-referenced throughout to the encyclopedic and authoritative Weedon Skin Pathology for further reference if necessary and selected content from the Weedon Skin Pathology is available online. Find the answers you need quickly and easily using the synoptic, bullet point format and structure. Efficiently review the key clinical and microscopic features of a complete range of neoplastic and non-neoplastic entities. View a full range of normal and abnormal findings with more than 3,000 full color images. Avoid diagnostic pitfalls using the detailed summary tables and algorithms.